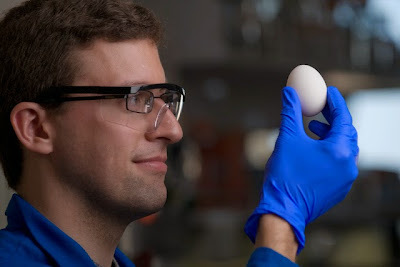 "Yes, we have invented a way to unboil a hen egg,” says molecular biologist and biochemist Gregory Weiss of the University of California, Irvine, of his team of colleagues and students. The University has now filed for a patent on the process, which involves adding a urea substance to reliquefy the solid material. On a molecular level, a vortex fluid device developed in Australia is used to stress the thin, microfluidic films, untangling the lysozyme proteins and forcing them back into proper form. The team claims the discovery has the potential to transform industrial and research production of proteins, with food production applications for use in farming and cheese-making, and pharmaceutical applications for cancer study and treatment.